Our award-winning hard floor cleaning equipment enables us to clean all your hard flooring and tiled surfaces. SJS are specialists in cleaning and sealing floor tiles, ceramic tiles, vinyl, wood and laminate flooring surfaces. We also have great experience in cleaning safety flooring found in healthcare and industrial environments, and recreational spaces such as sports halls, gyms and village halls. SJS are NCCA qualified in cleaning marble tiles in kitchen, bathroom and shower room spaces. We can also restore that showroom shine to your marble and granite worktop surfaces. Our working hours are flexible, and we always work with you to ensure that the floor tiles are cleaned with the least disruption to your day. We are floor and carpet cleaning experts, dedicated to making your home or business the best environment to be in. Natural stone floors such as marble and limestone have tiny pores, dips and cracks in the stone surface and this is where small particles of dirt and bacteria collect and build up very gradually over the years. SJS clean deep into these fissures and bring back that showroom gleam. 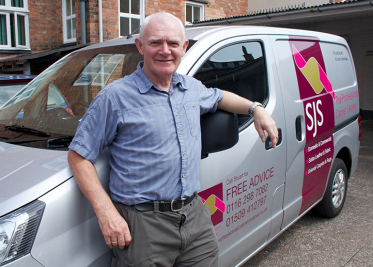 Stuart is a Senior Member of the NCCA and experienced in cleaning Victorian Ceramics, Flagstone, Travertine, Limestone, Sandstone, Ironstone, Marble, Granite, Slate, Terracotta, Quarry tiles, and modern Ceramic tiles. Our process will make it look brand new, remove all bacteria – including MRSA – and then seal it at an affordable cost. We have offices in Leicester and Loughborough and cover all the surrounding areas, so if you would like advice on how to clean, restore or re-seal your stone floor contact us today for a no obligation home or business visit, for our best advice and a completely free quotation. You will be amazed at how fabulous those vintage Victorian or Georgian tiles can look, or how magnificent an original flagstone floor should be. So, make sure you call us before you decide to replace it! Fantastic, informative and professional service provided by Stuart. I would recommend SJS without hesitation.